Just like humans, pets can suffer from life-threatening illness such as anaemia, toxicity, trauma or severe injury that could result in them needing a life-saving blood transfusion. The challenge with cats' blood is that it can't be stored like human or dog blood, that's why we are seeking cats who live locally to sign up to be donors. Owners must understand that they may receive a phone call at any time asking for emergency blood donation from their cat. 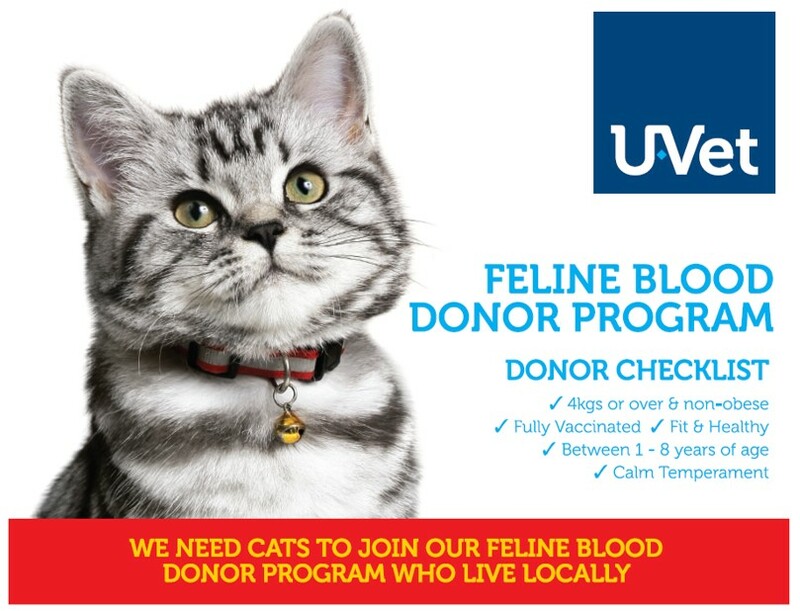 It's therefore preferable that donor cats live locally (within 20 minutes away from U-Vet Werribee Animal Hospital). Firstly we must take a blood sample to check blood type compatibility with the cat who requires transfusion. Due to the complexity of cats' blood, compatibility is critical. If your cat's blood is compatible we then run blood tests including haematology, biochemistry, FIV testing as well as a complete health check - this is all performed at no cost to you. Most cats are sedated by our Anaethesia team before donating, so please don't feed them prior if you can although we understand this isn't always possible. We collect the blood from your cat's jugular vein in their neck and we generally collect no more than 40-50ml of blood. After donating, your cat will be placed on an IV drip and monitored closely through recovery, then fed and cuddled when they wake. To show our appreciation, your cat will be smothered with lots of hugs, love and support and sent home with a large bag of food* as a massive thank you for choosing to donate and helping save the lives of critically ill cat patients in need! WE URGENTLY NEED LOCAL CAT DONORS! We are hoping to build a list of owners and willing cats who are happy to be called (potentially late at night!) to help any cats in desperate need of a blood transfusion. Please see our Feline Blood Donor Checklist to see if your cat is suitable to be place on our database. If you are interested in having your cat on the Feline Blood Donor Database please provide us with your best contact details and the name, age, vaccination status of your cat. You can contact the Blood Donor Program directly on 03-9731-2328 or UOM-Blood-Donor-Program@unimelb.edu.au. * Products, brands etc will vary.